Provide comfort for the family of Theron Rector with a meaningful gesture of sympathy. Theron "James" Walker Rector, 73, of Gray Court, went home on Sunday, March 3, 2019. Born in Greenville, he was the son of the late James Corbitt and Goldie Lee. He is survived by his sister Barbara Ann Manley. 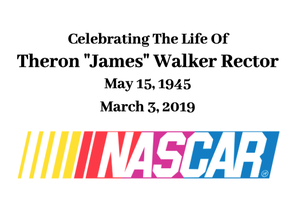 James loved Nascar and was a die hard fan. He will be remembered for his big heart and the number of friends he had. He was preceded in death by his son, Paul James Rector. The visitation will be held on Tuesday, March 19, 2019 at 2:00 pm at Palmetto Mortuary at 1017 Mauldin Road, Greenville, SC with a Memorial Service to follow at 3:00 pm. To send flowers in memory of Theron Walker Rector, please visit our Heartfelt Sympathies Store. We encourage you to share your most beloved memories of Theron here, so that the family and other loved ones can always see it. You can upload cherished photographs, or share your favorite stories, and can even comment on those shared by others.